Thanks to the Skywatch team: Tom, Sandy, Imac, Klaus and Ivar. Thanks to Dot who created this wonderful idea! Other Skywatch Friday participants are here. Whoa! Now those skies are very dramatic!! Looks like one low-riding sky! 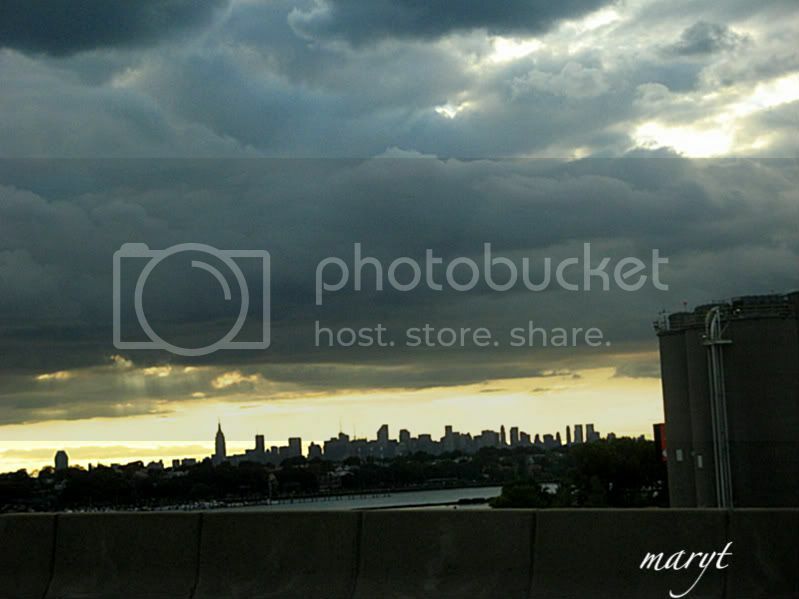 This is a beautiful shot of the sky and the skyline. I love it! Looks like a shelf. And the light - so eerie yet beautiful!! Wow, those are wonderful shots! There really is drama in those skies. Wow what skies over the city! I just love the NY skyline. Geez those are awesome. I didn't see beautiful skies this week here. That sky looks ominous to me. You're a good student - and you found some great examples of clouds. Very nicely captured. Thanks for sharing them with us. I love all the skies you show us. Here, we rarely have anything that interesting going on overhead. Oh wow! Those are phenomenal! What a scary sky !! Beautiful shots ! Fantastic. I wanted to see more photos of the shelf cloud. It looks like it can take a few people for a ride. How wonderful it would be if we could ride on clouds drifting away in the sky? Fantastic moody clouds weighing heavy on a grey world! Great drama! Wow … these are DRAMATIC skies for sure! Love the new holiday header! Makes me think I could get busy and change mine … almost. Life’s just too busy methinks … seriously! That said … I did include ‘holiday’ graphics in today’s post at Small Reflections, and I’ve shared a ‘foggy’ Sky Watch/Haiku Friday post at Sacred Ruminations this morning. Wow, what dramatic shots. Really stunning. 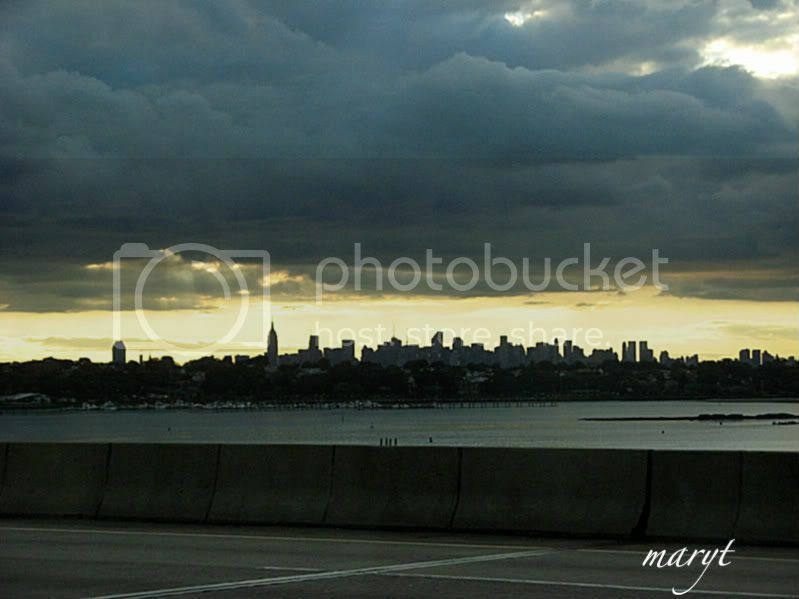 WOW that skyline is awesome I have never been to NY but it is amazing looking ~ Awesome cloud catching ! Mary, both of these are stunning. I love the band of light between heaven and earth. Wow, those skies, particularly the first, would be fitting for Halloween! looks like it's gonna be a wet new york, mary! we're getting the same skies over here at ontario, too! I love the NYC skyline. Great shot - sky and skyline! Ooooh. Watching the storm roll in. Great shots. Mary those are incredible shots. So beautiful and filled with drama.